The Winner Casino mission is simple yet seductive: 'Creating Winners'. And there are plenty of opportunities to do this at this Playtech site, whether you prefer poker, scratchcards, video slots, or live dealer casino. The emphasis at Winner Casino is on fair play – teams of accountants, programmers and lawyers are employed to ensure a level playing field. Head straight for the big money jackpots tab – here, you'll find a no-nonsense menu of linked Progressive games such as Megaball, progressive blackjack, Beach Life, the Incredible Hulk, Scarface, and Iron Man. The jackpot tickers surge higher by the second, and there are four different progressive jackpots – the Power, Extra Power, Super Power, and Ultimate Power. The Winner Live Casino is as genuine as it gets, as it's filmed in a live casino, with real dealers, authentic games, and real-time action. 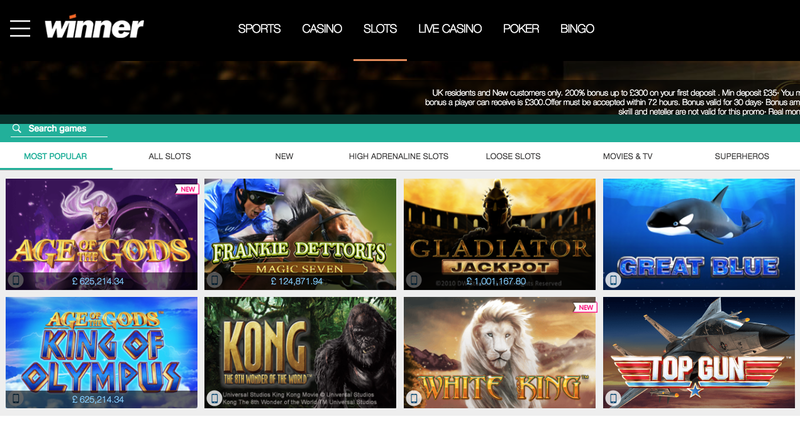 Download the casino for instant access to over 350 games, or play a more limited amount via Flash. Browsing through the games at Winner Casino is like walking down the Hollywood Walk of Fame – rub shoulders with Spiderman, Scarface, Gladiator Marvel characters, and the Incredible Hulk. Roulette, blackjack, pai gow, war, fruit machines, slots, bingo, keno. Playtech. Click the download button to install the 10 MB software. The mobile casino at Winner is a bit of a faff – you've got to follow links to send individual games to your device. Alternatively, type winner.com into your mobile browser to start playing. Winner Casino loses points for layout, as the menus are confusing, there are loads of flashing banners and pop-ups to kill. It's not the simplest casino to navigate - I kept losing my way repeatedly. Next time I'll use breadcrumbs to find my way back from the roulette table. All winners are equal at Winner Casino, but some are more equal than others. Especially those in the upper levels of the VIP club. Benefit from VIP treatment, your own account manager, and invitations to 5 star events. Visa, MasterCard, Diner's Club International, Delta, Click 2 Pay, Neteller casinos, Paysafecard. Games are independently audited by Technical Systems Testing. Winner is owned by the Zirconia Gaming Group, and registered in Antigua and Barbuda.